Be careful now, don’t start hyperventilating at the thought that you’ve somehow missed reading one of Ian Fleming’s small number of novels. 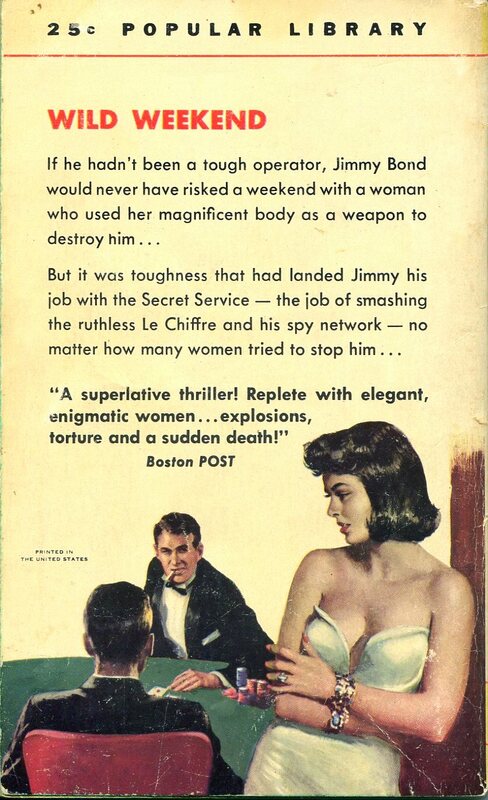 You Asked for It was simply the title given to the very first U.S. paperback version of Casino Royale, the book that introduced British super-spy James Bond, Agent 007, to the world. So who painted You Asked for It’s pulpish jacket? Well, there’s a mystery for you. According to novelist Bill Crider, who owns a copy of the paperback, “There’s absolutely no signature on that cover, nor is there any credit given to the artist on the inside.” Hoping for a more definitive answer, and because he’s been helpful to me before in solving this sort of puzzle, I dashed off an e-mail inquiry to Art Scott, the co-author of a comprehensive illustrated bibliography, The Paperback Covers of Robert McGinnis (2001), and a contributor to a forthcoming book from Donald M. Grant about McGinnis’ portraits of women. Alas, he couldn’t identify the artist here either. “[B]ut my best guess,” Scott wrote, “would be Ray Johnson, who did a lot of Pop [Library] covers in that era, and it looks like his style.” Johnson’s other works include the fronts of The World in the Evening, by Christopher Isherwood (1955); Mr. Trouble, by William Ard (1956); Love in Suburbia, by John Conway (1960); This Is My Night, by Richard Deming (1961); and Some Die Hard, by Nick Quarry (1961). Fortunately, the rebranding of Fleming’s debut thriller was short-lived. 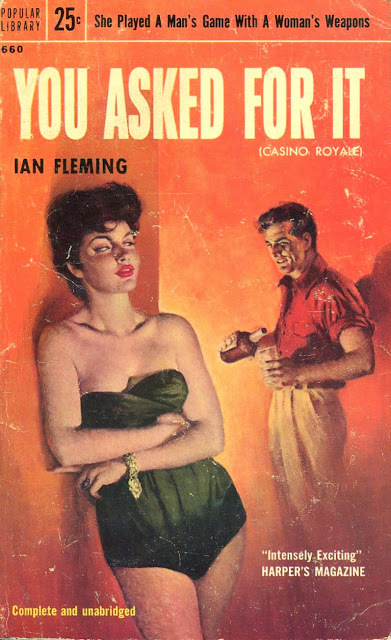 Popular Library’s You Asked for It (released in April 1955) was the only edition to carry that title. Signet Books picked up the U.S. rights to the James Bond novels after 1960 and restored the Casino Royale name. "Jimmy Bond" was the spy in the U.S. TV pilot, too. Seems to me it was also based on Casino Royale. I believe the TV pilot you're referring to here is that same episode of Climax I mention in the footnote to this blog post. Aha! In the fine print.